Cheers to owning my first ever Sigma brush! 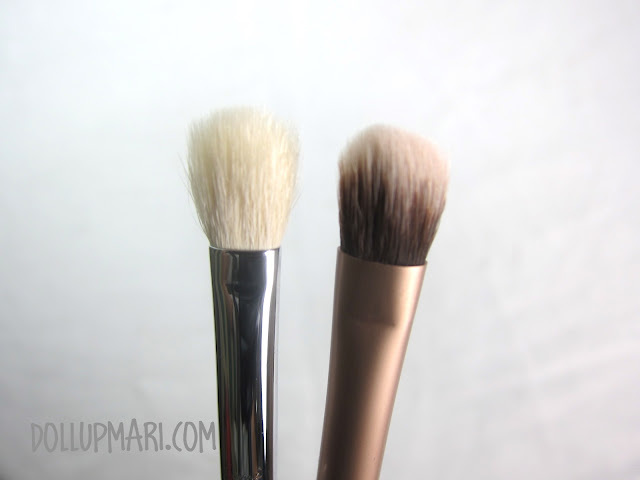 For the longest time I was already content with using whatever brushes there were at home, but I came to realize that more than makeup, brushes can make a big difference in how your makeup finish is. They often say that giving a girl a new set of better brushes will make her a better makeup artist overnight. And I guess I already know in my heart that my makeup addiction is not just a phase (because as of now my addiction is now celebrating six years), that's why I decided to take things up a notch. Back then my brushes just included a three piece eye makeup brush set from Tokidoki and whatever brushes my NAKED palettes had, and everything else was whatever I could rummage from mama's set. Now, I'm slowly adding stuff to my own collection. My first purchase was Sigma's E25 which is a blending brush. In a nutshell the brush is a semi-firm medium sized paddle brush with what seems to be natural fibers. I bought this brush because aside from the purpose of blending eyeshadow itself, I think that this is the kind of brush that can also apply eyeshadow in a less saturated way. Asians like me are not fans of over saturated eyeshadows because unlike Caucasians with deep set eyes, applying eyeshadow in an over saturated manner on an Asian girl's eyes will just make her look bruised and dirty. The brush came in this plastic tube with the sigma label over it, and brush itself also has a silver text of the brand, the purpose of the brush and the code. I just HATE it when my brushes (or any item for that matter) lose their labels, so I hope that this text will not fade anytime soon! Up close these are how the bristles look like. This is not as firm as how I would want it to be, but it's more or less firm enough. As for the color, I am a bit wary because I am not sure if the brush would be able to maintain this level of cleanliness in the long run. I mean I could clean it very often, but some brushes absorb the makeup on a permanent basis that even if I clean the brush all the time some eyeshadow residue is permanently on the bristles. 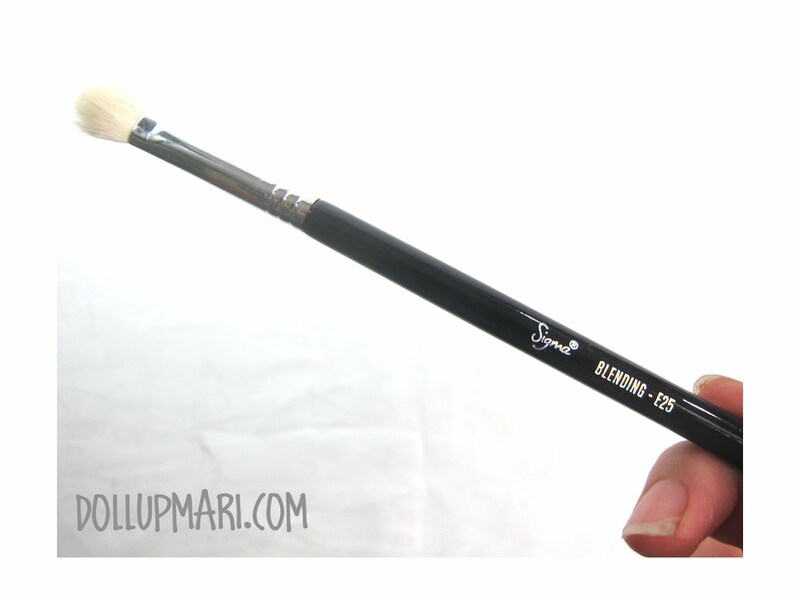 The brush is probably about 8 inches long, and is lightweight relative to my tokidoki Pittura brushes. It's paddle shaped, somewhat, but I wouldn't say that the brush is shaped like a perfect paddle. Usage wise, the brush feels soft on the skin. It applies color quite well, as it can really pick up the eyeshadow particles and deliver them onto the eyelid without fallout. 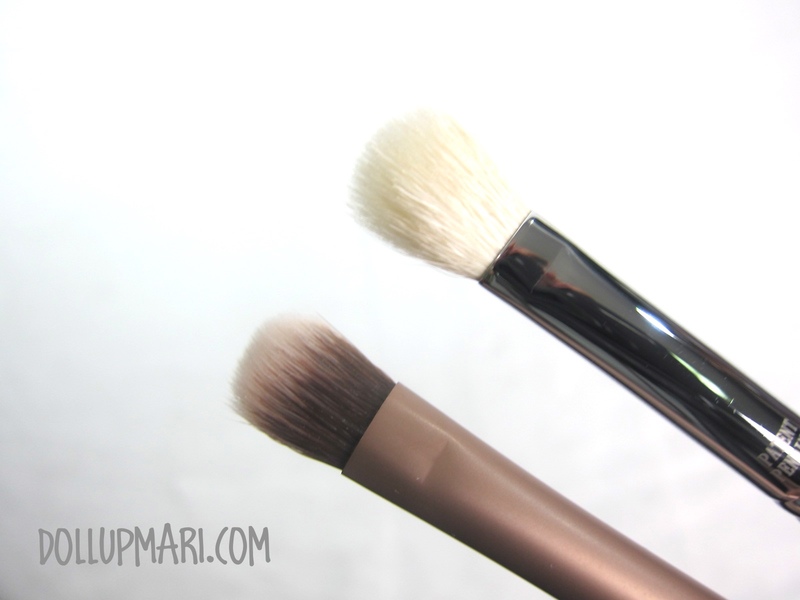 It also picks up particles so well that you might actually be able to save on eyeshadow! I mean my other brushes, when they pick up eyeshadow, they only pick up a little, and a lot becomes dust either on the side of the eyeshadow's pan or dust that'd fly into the air. 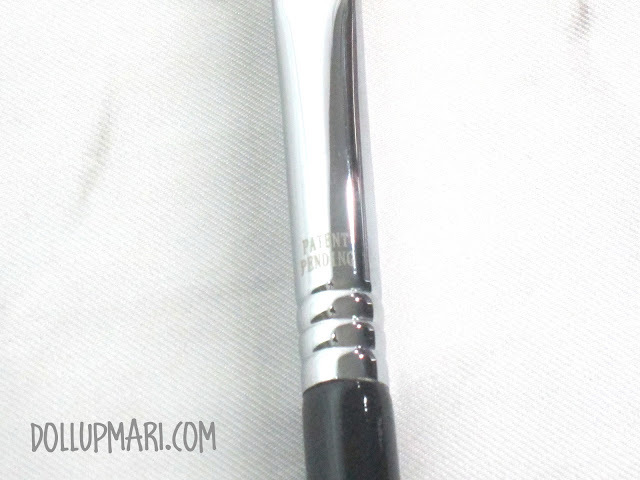 Using this brush, even with just gentle strokes on your eyeshadow, it can already pick color up and pick it up well so this brush can actually help avoid product wastage. 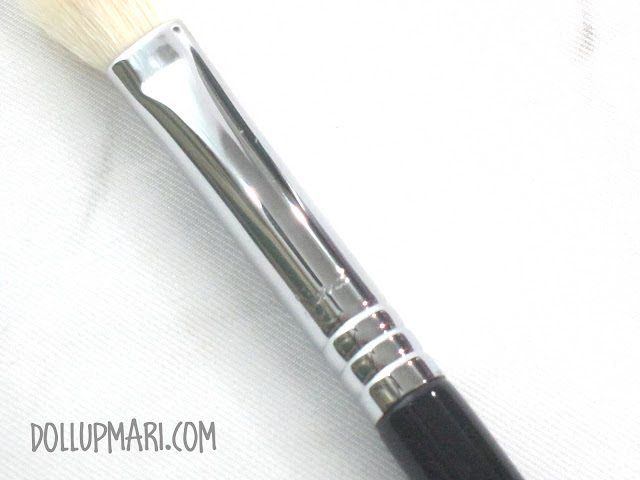 It did serve its purpose and my eyeshadows looked really blended after swiping this brush, and without much effort. The effect I achieved with this brush is the kind of effect that I can only achieve with other brushes after much effort and quite a lot of time. And yeah, on that note, because it blends so well so quickly, this brush can also save you time! Also, can I mention how well it does its job to blend? Back then, when I'd use the paddle brush that my NAKED palette came with to apply pigment, whatever brush that I use after, what happens is that the color becomes too unsaturated but there are still harsh eyeshadow lines. Using this brush, it did what I wanted to happen-- it blurred out the conspicious lines and blended WITHOUT diminishing the color or saturation of the eyeshadow. I can now ensure that I will get blended eyeshadow without losing the color even if I do not use eyeshadow primer! Woo hoo! 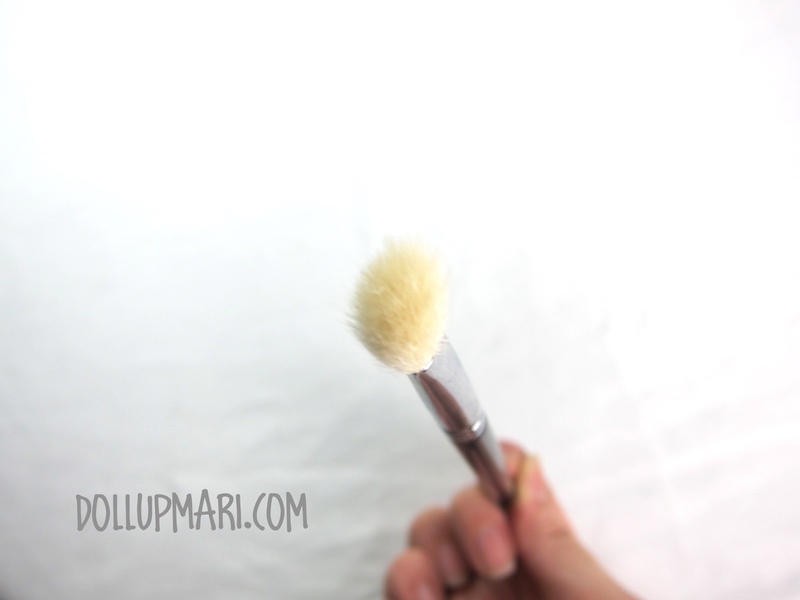 This is the kind of brush that you can use even with glittery eyeshadows, but most definitely not the brush for when you're really using glitter powder. You would want a flat paddle brush to do that (like Sigma's E55). Up close you can see a 'Patent Pending' etched on one side. The main feature I actually noticed about this brush is that the ferrule (the metal connecting the hairs to the stick part) are these three rings (right below the patent pending label). Most of my other brushes have the ferrules hastily glued onto the stick part, and some others have one ring at most. This is the first time I have seen a brush with this feature. this means that it will take a very long time before the ferrule gets detached from the stick, or better, it might not even get detached throughout its whole life at all! This also means that even if the stick part gets wet, you can expect the material to still be undamaged even after a long time because there's virtually no way for water to seep through the rings and damage whatever material may be inside. And now let me help you guys. I mean when I was deciding on whether I should buy this brush or not I was disappointed on how little size references there were on google searches. There were a lot of bloggers talking about this brush but no one gave a reliable size guide, so I was wary at first that this brush might actually be too big for my Asian eyes. 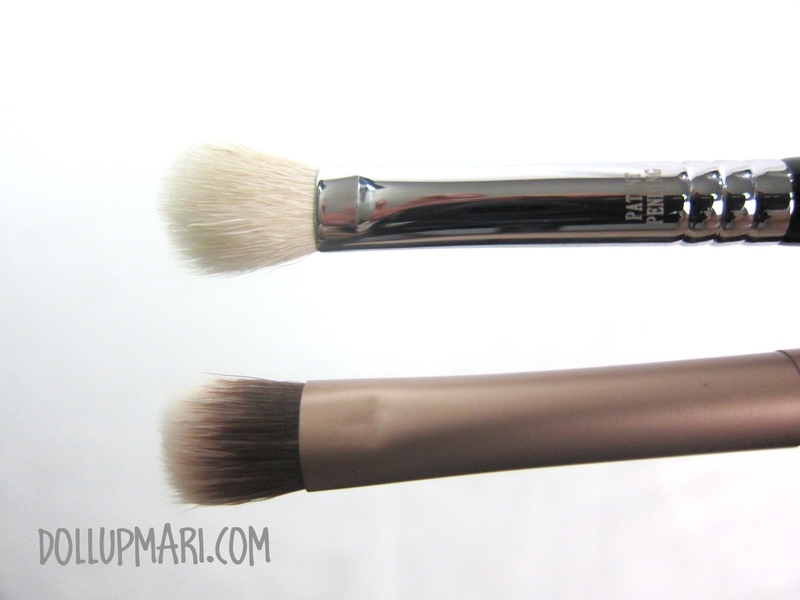 So this is the Sigma E25 brush beside the NAKED 3's brush. I hope this information helps! To those who may be curious, I got this item from Beautyholic Manila for 775 pesos. What are your go-to brushes? Please do tell me in the comments box!